Is magic in the water at Friars Point? Blues legend Robert Johnson not only played there outside Hirsburg's Drug Store, his lyrics from "Traveling Riverside Blues" are immortalized all the way "across the pond" to the repertoires of Eric Clapton and Led Zeppelin. 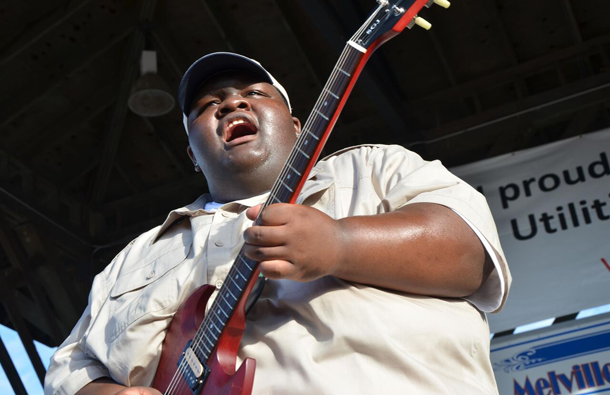 Decades later the once bustling town is making news again as the home of phenomenal guitarist Christone Xavier "Kingfish" Ingram, a 19-year old who plays with the explosive and seasoned dexterity of Jimi Hendrix . The Sunflower Festival's Friday night headliner is at home now following four sellout performances at the Biscuits and Blues Festival in San Francisco. Soon he'll be hitting the road again for the Telluride Blues Festival and the Rhythm and Blues Cruise. Along the way, Ingram has earned international mentoring from Buddy Guy, chief advisor on the release of his recently completed album, and BBC media guru/artist Jools Holland who traveled to Clarksdale several months ago to meet Ingram and play keyboard with him and his band at Red's. "Way back I played at the Sunflower Festival with the Delta Blues Museum's student band instructed by Richard Crisman and Bill Howlin' Madd Perry and again in 2016. I am very grateful to be invited as a headliner this year," says Ingram. Playing drums as a six-year-old, he switched to bass, changed to guitar, and at age 11 he was performing all over Clarksdale including Ground Zero Blues Club. Especially different too was a gig at the White House with First Lady Michelle Obama presiding when the DMB Band was honored with the National Arts and Humanity Youth Program Award as one of America's outstanding after-school educational programs. Although his musical interests are centered on blues, Ingram also enjoys rock and some rap. He says his new celebrity status has not created hordes of screaming fans, but he doesn't sound adverse to the idea. His mother, Princess Ingram, says her son's middle name, "Xavier," means "to be bright and smart." Asked what is going on in his mind when he begins a show or if he concentrates primarily on dexterity, Ingram says, "I am in another world; I am IN THE MOMENT." From Eric Clapton's text: "Discovering Robert Johnson" accompanying "Robert Johnson: The Complete Recordings: he writes:"It came as something of a shock to me that there could be anything that powerful....What struck me about the Robert Johnson album was that it seemed like he wasn't playing for an audience at all. ...he was just playing for himself. It was almost as if he felt things so acutely he found it almost unbearable...."
"Most listeners at "Kingfish" concerts are convinced and agree they are in the presence of incredible talent," says Melvita Presley, Sunflower chair. "We know our hometown crowd will turn out for this fabulous home boy." The 31st annual festival kicks off Friday night on the downtown main stage; six acoustic stages in downtown club and restaurants Saturday afternoon, main stage Saturday night, and Sunday's gospel festival opens at 4 p.m. Sunday in the Civic Auditorium. The entire festival is staged by volunteers and is free and open to the public.